OUR CAT WINDY IS LOST IN LAWRENCE, KANSAS. PLEASE HELP! Last seen at Econolodge in Lawrence, KS, off exit 202 on I-70 (KS Turnpike) on MONDAY 2/8. Windy is a black & white tuxedo short haired cat. She is six years old, not wearing a collar, but is microchipped. She has a really high pitched squeaky meow, loves men, is extremely sweet (but shy). We do not know if she is INSIDE the Econolodge or OUTSIDE. We have all the hotel staff helping us look! The local shelter and vets have been notified. We do not live in Kansas. We were moving from Atlanta, GA to Portland, OR, when we stopped here after a day full of driving. Windy must have slipped out the door as we went to the soda machine or to get something out of the car after we had finished unpacking. We did NOT see her leave. But she is definitely not in the hotel room! This is very unlike Windy. She does not like the outdoors and she is not very adventurous. Wherever Windy is, she is probably very scared and hiding, hoping someone comes along to find her! Being raised in Atlanta, she has never seen snow and we are afraid she will not last long outdoors. But please, do not stop looking. There is a $500 CASH REWARD for anyone who finds her, no matter HOW far in the future. She has been through so much with us and this is like losing our own child. We have extended our stay here until 2/10 to search. However, afterwards we have to leave. We do not want to leave without her but we have deadlines and cannot afford to live in a hotel… 😦 With that being said, please do NOT stop looking! We will be arranging with a vet to board her until we can fly back to get her if she is found after we leave. The Econolodge hotel also has her cat carrier for safe transport! DO NOT WORRY. There will be very little burden on you if you do find her! Everything is arranged. Please pray that Windy is okay. Update 2/09 11:35pm: We still have not found Windy. We have spent the day handing out fliers and searching outside. We do not think she would go very far, but she can always surprise! We have not lost hope!! Please spread http://www.findwindy.com/ on Twitter and Facebook! We are counting on this being VIRAL since we do not know anyone in Kansas! Thank you. -xoxo Windy’s loving parents. a morning search party if anyone is free. Get in touch. Thank you everyone!!!! Update 02/13 2:06pm: Windy was just spotted at the Canyon Court apartments at 700 Comet Lane! She was seen running into the storm drain between Stone Creek and Canyon Court! Looking for someone to get and set a live trap with tuna. You will be reimbursed plus recieve an extra gift for your efforts! I think this is our best bet on getting her since she is living in the storm drain. One can probably be purchased at a feed and farm supply store. We are on our way back and should arrive around midnight tonight. We are excited to be so close! Please contact at 404-218-5008 if you can place the trap! Update 12/15 1:48am: We watched the trap for 13 hours. It then got far too cold for any of the cats to come out anymore, and the tuna would just immediately freeze. Also, we got to thinking about what Windy looked like. 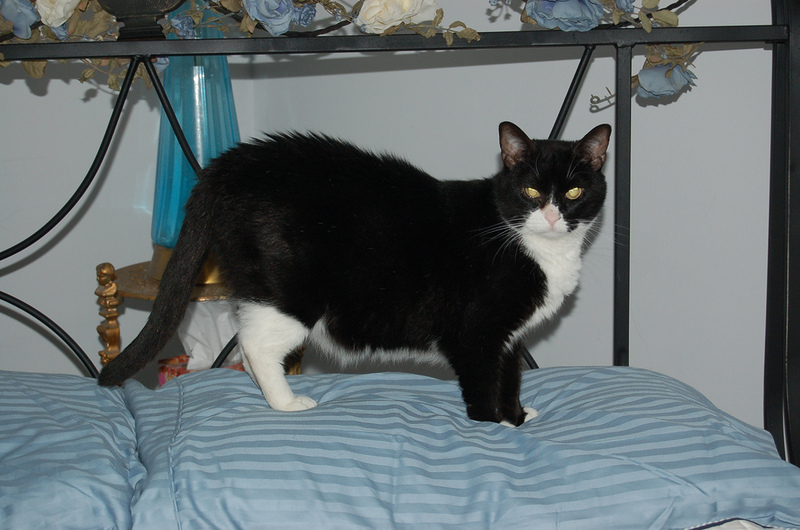 Windy has one feature that stands her out from the other tuxedo colored cats: her white hind legs. We are around 85-90% sure that the cat we were hoping was Windy, is in fact not. The legs were too dark. We are very saddened by this, as we thought we were so close! Of course if anyone is in the area and spots a black a white cat, please take note of the hind legs. It’s always possible there is more than one in the area and we just did not see her today. I guess now we start over at step one: clues. We’ll be heading over to the Econolodge area tomorrow morning before we start our drive back to Oregon. We would love to stay longer but we have 3 more wonderful cats and 2 great dogs in our care, plus Michael’s work has extended his start date as long as they could already. We’ll talk to the businesses around the Econolodge and see if there are any clues. They already have our phone number, but it’s worth a shot while we’re here! I’d also like to try to set the trap out at a certain spot near the Econolodge, but I’d need someone to do this for us and check it, since we have to leave. Our new friend Frank (in the comments) has kindly agreed to house the trap until something is arranged. Also, kudos to Frank as he has been a wonderful help and very kind! On another note, is anyone aware of a missing long haired Siamese? We spotted one at the sewer grates a few times and she definitely did not look like a feral stray. She was slightly plump, very playful, and less skiddish than the other cats in the area. Pass on the word! I’ll also call the humane society tomorrow to see if anyone has reported her missing. We haven’t lost hope. Just because she has not been found yet, doesn’t mean she won’t be. Thank you everyone 🙂 Let’s keep spreading the word and saying prayers, for Windy! Update 2/15 9:45am: We just got a call from the Econolodge, they say they just found Windy!! We are headed back right now, we only have about 30miles to backtrack. I will update on how she is! We are SOOOO happy!!!! !